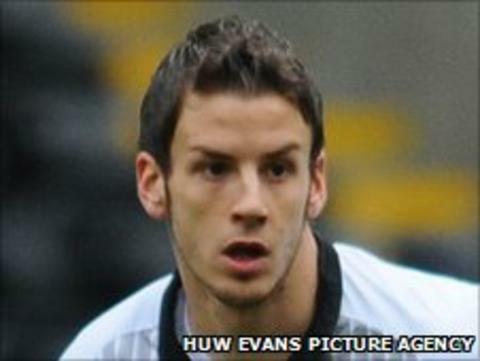 Andrea Orlandi has signed a year's extension to his Swansea City contract keeping him at the club until the end of the 2012-13 season. The Swans are due now to sit down with Joe Allen and Nathan Dyer to secure their future with the club. "Brendan [Rodgers] was keen to ensure Andrea was retained as an important member of the squad," said chairman Huw Jenkins. Wing Orlandi, 26, follows Angel Rangel, who has just signed a three-year deal. Orlandi, the former Barcelona midfielder, made 20 league appearances in the 2010-11 season, and the 26-year-old is seen as a player who can help the club make its mark in the Premier League. "He has grown into the squad over the past few years and his technical ability is well suited to the Premier League," added Jenkins. "We are delighted that Andrea has decided to extend his contract, and we look forward to seeing him play his part as the club looks to make an impact in the Premier League." Orlandi was brought to the Swans by Roberto Martinez and was linked with Leicester City when Paulo Sousa moved from the Liberty Satdium to the Walker Stadium in 2010. But instead of moving to the east midlands Orlandi opted to sign a fresh two-year contract Swansea. Following the club's promotion to the Premier League, the Swans are planning to sit down with a number of players they feel are pivotal to the club's future. The cash windfall earned by winning the Championship play-off final means the club are now in a position to offer extended deals to players still under contract. "Improving and extending certain players' contracts well in advance is something we can know look into thanks to our Premier League status," insisted Jenkins. "Over the last few years we have been asked by supporters why the club did not do it, but the simple explanation is that we were not in a financial position to do so. "The budget was set to compete in the Championship, so any further money spent on securing certain players' contracts earlier would have jeopardised certain signings along the way. "An example of that is Fabio Borini. We budgeted well and that allowed us to add a quality player like Fabio to the team for the final push. "I think it is important to explain this to everyone connected with the club, so we are all on the same page. "So we will be looking to sit down with the likes of Joe Allen, Nathan Dyer and Jazz Richards,and ensure their contracts and cover our assets in advance." Meanwhile, it looks unlikely a deal will go ahead for Swans target Jonathan Soriano. Following talks with the Barcelona B striker's representatives over the weekend, the Swans have opted not to follow up their interest. "Nothing has been concluded," admitted Jenkins. "We were prepared to offer the player an opportunity to join our squad in our first season in the Premier League, but we were not happy with the terms of the deal to suit Swansea City Football Club. "We continue to look at all of our options."